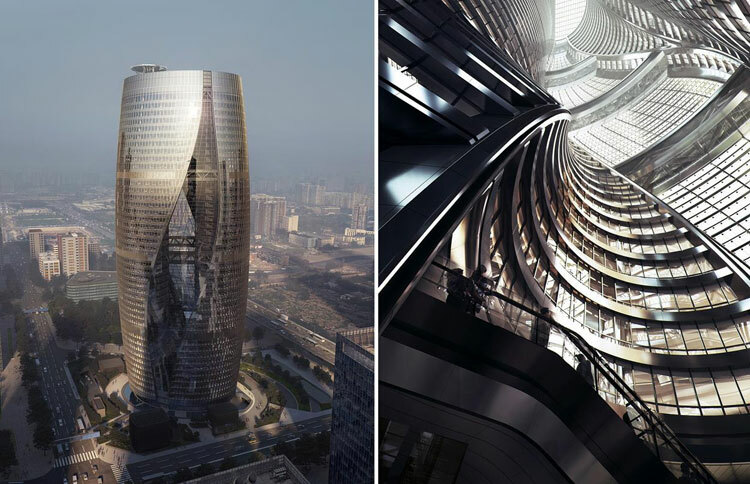 ZHA Architects recently released new images of the 46-storey, 207 metre Leeza Soho mixed-use tower, under construction in Beijing, which has what’s thought to be world’s tallest atrium. Construction of the tower, which has a gross floor area of 172,800 m2, has now reached level 20. Designed by the late Zaha Hadid and current ZHA director Patrik Schumacher for Chinese developer SOHO China, it is located in the new Lize business, residential and transport ‘hub’ in south-west Beijing, directly above a new subway line intersection. The practice describes the mixed-use building as “anchoring the financial district,” and its distinctive design as having “evolved from its specific site conditions. The tower rises as a single volume divided into two halves on either side of the subway tunnel.” Connecting the two halves, the central atrium will extend 190 metres, the full height of the building, and will be a new public space for the city. 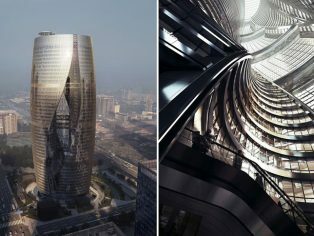 “As the tower rises,” said ZHA, “the diagonal axis through the site defined by the subway tunnel is re-aligned by ‘twisting’ the atrium through 45º to orientate the atrium’s higher floors with the east-west access of Lize Road.” This twisting allows natural light into and views out of the centre of the building. ZHA has extensively employed 3D BIM in the project, including to “significantly reduce energy consumption and emissions”. The Leeza Soho is targeted to achieve LEED Gold certification, with completion in late 2018.